Sunshine Through the Rain: My first ever WIP Wednesday! I'm so excited to be able to link up to WIP Wednesday for the first time! My first WIP are these embroidered ABC blocks. I have been following the 'S is for Stitch' ABC BOW at Liz's. I am slightly behind but it has been fun and do-able to work on one block each week. I am really learning to love embroidery. I am also working on my quilt for the 2014 Pantone Quilt Challenge hosted by Adrianne and Anne. I love the brightness of purples and pinks and have decided to combine these with lots of neutrals. At the moment I don't have a definite plan in my head, I'm just enjoying making blocks! And I do have a finish to share. I made this cute Ellie Travel Case following Heidi's tutorial. It is a great tutorial and came together really easily. This is heading off in the mail for a friends birthday. Welcome to WIP! You have been busy with a variety of projects - very exciting. Your embroidery is looking great. I recognise the purple Acacia piece in you block and the travel case looks wonderful! 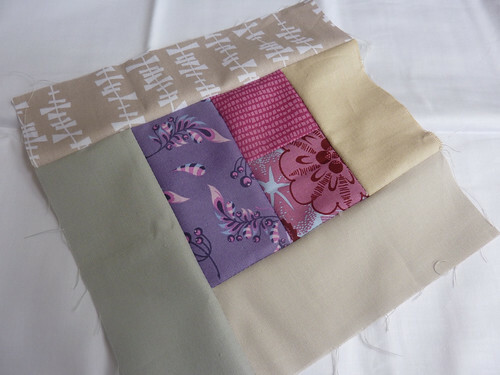 I find it's such fun making blocks from 'scraps' like your purples, pinks and neutrals. Brave you doing embroidery too - looks great. Love your choice of neutrals with the purple, very stylish! 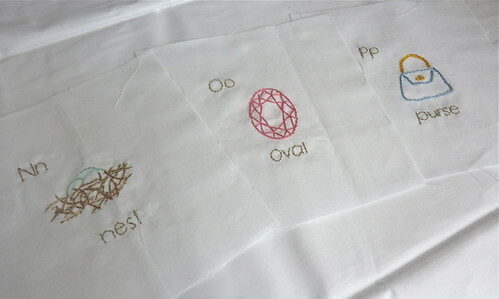 I love the embroidered blocks I need to check out that SAL! I love all your projects. The embroidery blocks are so cute! Good on you for enbracing the pantone colour. The purples look great with the neutrals. I like that you dont have a plan for your blocks yet. 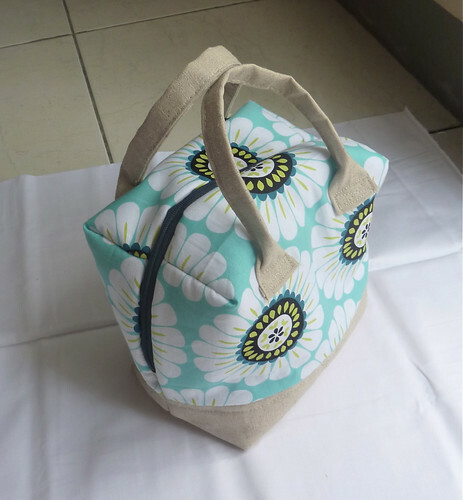 I love that travel bag, it's such a fun shape, and that big flower print is eyecatching!! yay for you on your first WIP Wednesday; i am sure there will be many more to follow. You have lots of fun projects! i especially love the pretty Ellie bag. That would be such a great gift to receive!! It's going to be so great seeing what everyone comes up with for the radiant orchid challenge. The bag looks great, and the embroidery is coming along nicely! I wish I could sew like you, not having a plan for the blocks and just sewing them and seeing what you come up with - brilliant :) Lucky friend that is receiving the bag! What a fabulous travel case! Oh I am impressed with that case! It looks fantastic! I am going to check out the Pantone challenge. Last year I did one for emerald but I'm not sure I have time to do this years. I'll check it out! Looking forward to seeing yours develop because there couldn't be a prettier color scheme! Sooo much cuteness! The case looks totally adorable! I really would like to take up embroidery, but I can't seem to find the time right now. :) Good luck! What fun projects! I love your Ellie Travel Case. Lovely fabric. Great projects, love your embroidery! Can't wait to see them progress. These are some pretty projects! What a cute bag! How lovely is your Ellie Travel bag!! Love those fabrics! those embroideries are so sweet! and your bag turned out very cute. what a great pattern.